A fascinating and inspiring Field Trip to conducted by Paul Bennett (The Old Stones of Elmet) & John Dixon (Journeys through Brigantia). A complex circular henge monument, probably built in several separate phases and dating to the Bronze Age. The Bleasdale circle is situated in the centre of a peat moss known at Admarsh, which is situated between the two headstreams of the River Brock, at the foot of Fairsnape Fell. It was discovered in 1898 by J. Kelsall and S.Jackson, and partly excavated by them during 1898-1900. The circle is comprised of an inner circular structure set within an outer circular palisade. The inner structure has a central grave, which was the primary and only burial. This central grave is surrounded by 11 oak posts forming a ring 36ft in diameter. This post ring is surrounded by a pennanular ditch, straight sided and flat bottomed. It was lined with birch poles laid flat in the bottom. A causeway flanked by 3 oak posts on each side links the outer circle to the inner circle. The outer palisade is roughly circular and surrounded by a ditch, having a diameter of 150ft with a break in the south west marked by especially large posts. It nearly touches the inner circle opposite the causeway. What does this enigmatic henge monument represent? A spiritual or cult centre ? A Bronze Age Mall ? Secreted away in the deeply wooded Whitewell Gorge can be found a singular limestone outcrop that contains a number of caves known as ‘The Fairy Holes’. Due to the hidden nature of the site very few have visited the caves. The larger cave was an ancient rock shelter with evidence of early human habitation. Stone tools and bones were excavated here along with a Bronze Age Urn. This cave is large enough to walk into goes back about 20 metres opening out into a curious bell-shaped chamber – Great photo opportunities to be had here! Those of you who wish to participate in this field trip, please contact Paulus for meet-up times (it is proposed that we meet on Tesco car park in Clitheroe at 11am for 12 noon at Admarsh Church, free parking, Bleasdale - less than half mile easy walk to circle complex. There is no charge for this event, all welcome. I'm truly looking forward to this misself, as I've not been to the Bleasdale site and it looks truly intriguing. I should say that it's mainly gonna be John who'll be giving us much of the info on the day, as this is more his area and the fella truly knows his stuff! Please let us know if anyone has extra spaces in vehicles - and if we're slightly late, hang on till we arrive! Hope to see a few of y' there on the day. Lots of Pack horse references on the map, how old a trade route ? p.s. who's the Thursday rain forcast Johna ? 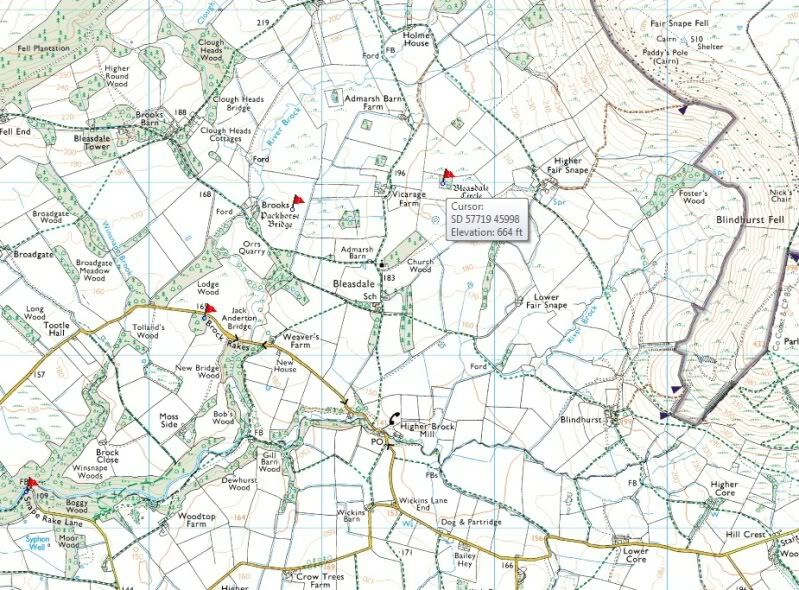 A Roman road passes NE from the top of Longridge Fell through the map area to Galgate (again pack-horse route name). The nearest major village is Chipping - refering to a market in pre-Conquest times. Beacon Fell stands to the south of Bleasdale. But would anyone by chance be going from somewhere in Oxfordshire and coming back during the day? Would really love to come but stuck down here in the south for that week. If not, I could always check out the train tickets. chaffinches wrote: But would anyone by chance be going from somewhere in Oxfordshire and coming back during the day? Would really love to come but stuck down here in the south for that week. If not, I could always check out the train tickets. Haha, now that would be cutting it fine. Thanks for the offer though - kind, if a bit ridiculous. Ahh looking at the train routes and middle-of-nowhereness of Bleasdale Circle it might just be too devilishly complicated. You lot have fun! Wish I could have come, would have like to meet you's but can't get out of work unfortunately. Have a good trip! laughingball wrote: ........ but can't get out of work unfortunately. Tell your employer you need the day off for religous reasons!! Greetings Stoners, I'm interested in joining this field trip. I live in Clitheroe and have two spare seats going begging if anyone is interested. Is Tesco at 11am still the time and place? Rod. Tesco car park, Clitheroe 11am. is the meet-up time Rod.